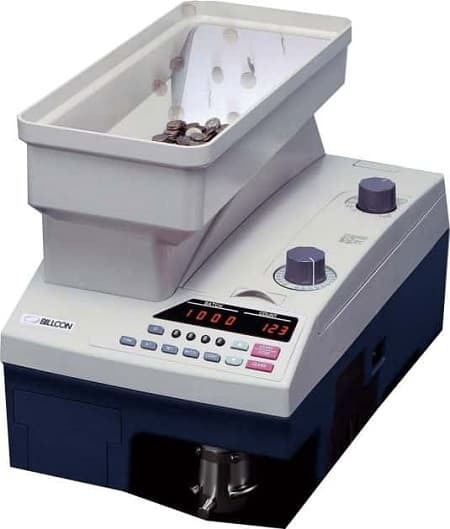 Billcon CHS-10 coin counter and off sorter with high volume of counting rate of 4000 per minute (dime). This unit is an accurate, efficient coin counter. You can wrapp the coins with attached coin tube holders or continue counting in large capacity bag holders with optional stop batch setting. While counting the smaller size coins are rejected into a reject box or bag attachment, while selected larger size coins will rejet from the front bag holder or optional wrapping tubes. For operators - the CHS-10 is extremely easy to use and simplifying their work. Unit Dimensions: 11.8" x 19.7" x 13.6"
11.8" x 19.7" x 13.6"